* iTunes rewind 2010:Chosen as one of the Top free of the year 2010 of Germany and Japan. 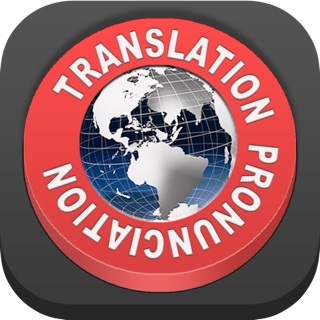 Are you still looking for a full-text mobile translation application easy to use? Are you still worrying about the pronunciation when you see the text translated? 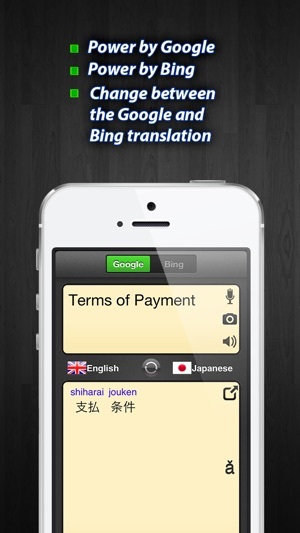 Support the mutual translation of 64 languages and can be changed between the Google and Bing translation engines(The internet connection is required). Support the phonetic pronunciation of 17 languages. 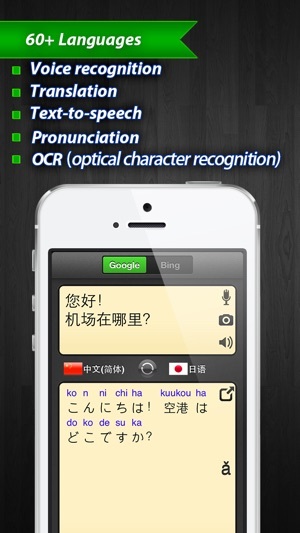 Different from the other full-text translation apps, the phonetic pronunciation is word by word. * TTS(Text To Speech )of 17 languages . Truly natural sounding voices. Support 17 languages and 54 voices. 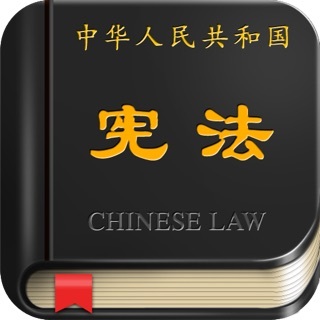 After the download , the audio pronunciation can be used off-line. 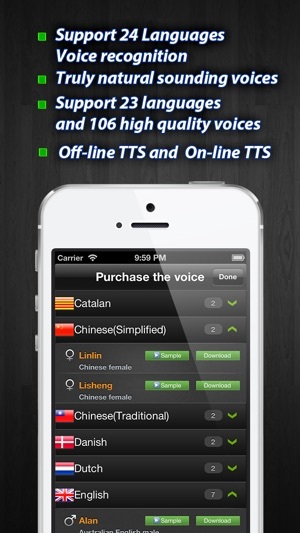 Different from the on-line TTS apps, it provide high quality voices and can read long texts without the word limit. * TTS(Text To Speech )of 24 languages . Truly natural sounding voices. 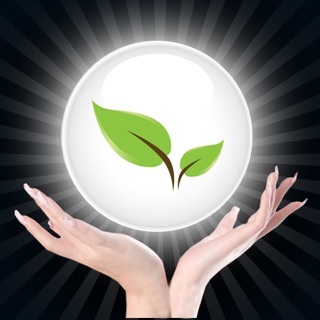 Support 24 languages and 43 voices. The audio pronunciation can be used on-line. 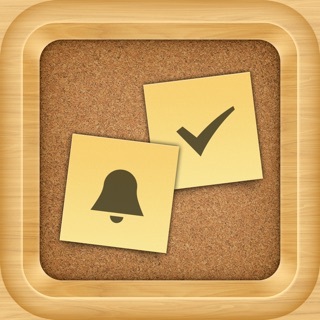 * ASR(Speech Recognition )of 15 languages . 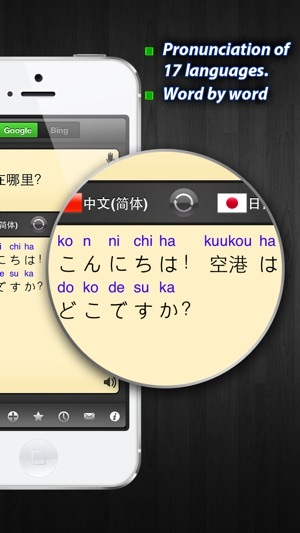 Support 15 languages for free-form dictation voice recognition. 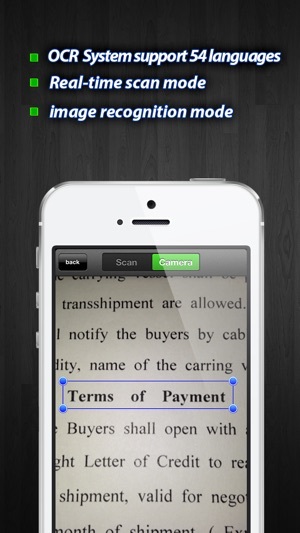 * OCR (optical character recognition) . 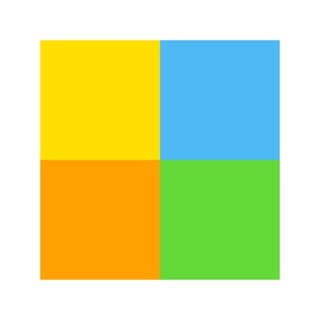 Automatic language detection, double-click to enlarge, the font size change, reading rate adjustment, Email and SMS messaging, favorites and history features. To coś mówi w tak beznadziejny sposób, że niewiele da się zrozumieć nawet w swoim ojczystym języku! Słowa nakładają się na siebie, są niewyraźne i zniekształcone! Oszustwo. Pozostałe recenzje pisali sami twórcy. Szczerze odradzam. Wyrzucone pieniądze, bo program może i jest darmowy, ale każdy głos trzeba sobie już kupić. W sumie w miarę normalny pakiet kilku języków jest już cholernie drogi, a płaci się tak naprawdę za jakiś bełkot. Szczerze odradzam! Świetny program, aż dziwne że darmowy. Ściągajcie bo za free!